Underwhelmed. Either this is a bottle movie, or they're fiercely avoiding spoilers, or they still can't make a proper trailer. Double 180 gram LP. Tri-fold reversible jacket with soft-touch finish. Includes 60” x 12” poster, 36” x 12” poster, and a 12-page booklet insert with stills from the movie. ^think that's a solid post. 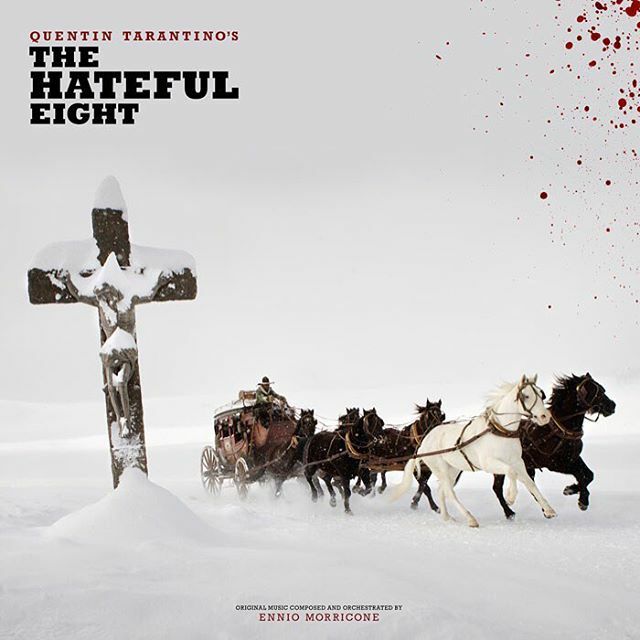 today there's a catty article on Playlist about "Projection Problems Plague 70mm L.A. Press Screening Of Quentin Tarantino's 'The Hateful Eight'"
There has been much spilled ink about the efforts by Tarantino, Christopher Nolan, Paul Thomas Anderson, and others to save film stock and when they can, project on film as well. But the hurdle will always be convincing audiences they are truly getting a noticeably different and presumably better experience than seeing something digitally. There's still a couple of weeks to go, but let's hope for the sake of "The Hateful Eight" and the investment made to bring back a long dormant format, that audiences will be getting some special, without any issues, or the big comeback of 70mm may be over before it ever really starts. i'll just lol. sorry you had a rough first world day playlist. haha, i'm actually looking forward to this. look at that cast! its hilarious how quickly they made that sandler movie. The Playlist has a review. The filmmaker's latest outlandish ensemble drama is an uncompromising epic that's pure Tarantino. Welcome back to Planet Quentin, a self-contained universe of cinematic pastiche, outrageous dialogue, cartoonish violence and labyrinthine storytelling that plows ahead while veering off on tangents every which way. These vibrant ingredients have been the touchstones of Tarantino's oeuvre for nearly 25 years, but "The Hateful Eight" unleashes them in a wild, unvarnished stream of possibilities. This is not a filmmaker whose work tends to show signs of compromise, but the unwieldy excesses of "The Hateful Eight" proves he can get away with anything. While "The Hateful Eight" meanders, it never drags. Tarantino has ostensibly constructed a slow-burn whodunit sped up by the vivacity of his characters. Interlocking agendas collide when a pair of bounty hunters show up at a cabin in the midst of a snowstorm, where their fellow stranded travelers form a suspicious bunch. Everyone's a suspect, but nobody's entirely innocent. During the aforementioned first hour, the filmmaker gradually establishes the Wyoming-set world of post-Civil War attitudes, and it's no surprise to find that they aren't pretty.